The Holy Rosary, if prayed with dedication, and singularity of heart, allows one that prays purification, a desire for the things of God's church which include the sacraments, and as God allows the soul will touch the edge of eternity in preparation for their judgment. How can one prepare for eternity, if we have no tangible concept of the Holy Realm? Can the finite touch the infinite? Yes, but only as God allows, for not by our own merit can man interact with eternity unless our hearts are aligned with God. God in His goodness has given us the Holy Sacraments of the Church as the way that a sinfully inclined man who will one day taste death experience the actuality of his own judgment. God does this so that we may have a small taste of the absence of Him to call us again to humility. He allows this so that we will not experience a permanent separation from Him in Hell. When we again humble ourselves before Him, He embraces us even tighter giving us more than we can imagine or express. There are two things that shall never be in heaven, they are pride and disobedience. God will purify a soul of all pride and disobedience and if we cooperate with this purification we can attain heaven. God always speaks life, and the Hail Mary, or angelic salutation, are words of life given by God through the Archangel Gabriel, raining down upon us. “Hail favored one the Lord is with you.” (Luke 1:28). Wherever God's words have been vocalized in prayer, life blossoms. We cannot forget that nothing evil is ever going to touch Mary. Mary, as Jesus's Mother has the absolute protection of the whole Trinity. 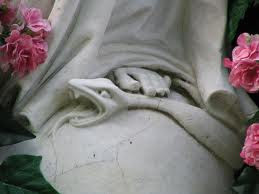 Those that pray the Rosary daily, and seek to console her Immaculate Heart, already have a soft spot with Jesus because He loves His Mother so much. The devil cannot stand to be where the life of God flows, so he will always seek to disrupt or destroy it. But with the angelic salutation, he cannot touch those that pray the Rosary. The Rosary has a ‘loosening’ quality that counters the chains that the devil seeks to bind us. The devil chains to himself those that are in sin, but by the Rosary we place the Rosary around the person we pray for and gently pull them towards Jesus. The Rosary always leads to repentance of sin, whether you are praying for yourself or for another. 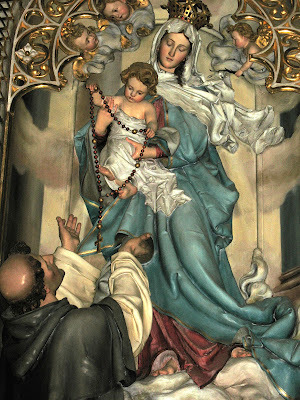 If you pray the Rosary for someone and you don't think there is a change, remember the words of our Lord, “This kind can come out by nothing but prayer and fasting.” (Mark 9:29). So then add some form of fasting to help the person you are praying for to come to repentance. So when you pray the Rosary with devotion you are purifying your soul and loosening the chains of the devil, either for you or for another. The chains are only fully cut when the soul in true repentance goes to Holy Confession. The Rosary always gives us the desire for participation in the sacraments. When the chains are cut to the devil after Holy Confession, then with penance, we begin the process of purification from the devils influence. If you roll in mud, when you get up, you may no longer be rolling in mud, but you definitely need to be cleaned. Once unchained, cleaned and purified, now you need to stay with the Sacraments of the Church to keep strong for the battle for others. Praying the Rosary for someone places the prayers of the Rosary around the person and pulls them away from their sins in such a way that does not impede their free will. The Rosary is a mini form of exorcism because it pushes the devil away and also looses the bonds that the demon has on anyone you pray for. Praying the Rosary in public can send the demon running. Catholics are called to bring their Rosaries into the public forum, praying them for anyone they may encounter and making the devil flee. If you know how much the devil fears the blessed Rosary that you hold, you would never let it out of your hand nor cease praying it. You will find that those that are in mortal sin (chained to the devil) will want to run from the Rosary that you hold. The Rosary prayed in public will always give a reaction of those around you, and if your heart is aligned to the will of God, He may give you knowledge of the state of some of the souls around you. This knowledge is for the betterment of their souls through your prayers only. We know that there are legions of angels in heaven, because Jesus spoke of them, but we must never forget that there are legions of fallen angels also. Praying the Holy Rosary can send an entire legion of fallen angels running. Think of that for a moment how one devoted soul, praying the Holy Rosary can, as God wills, cleanse an area of demonic influence. The Holy Rosary not only purifies souls, but it can purify lands and nations. Pray the Rosary, pray it often, pray it in public.